1. If at all possible, opt for wild salmon. I know, the differences between wild salmon and farm-raised salmon have been hotly debated. Still, whenever I can get my hands on quality wild salmon, that is my choice. Aside from health benefits, it has a silky texture; brilliant hue; and overall superior taste. 2. 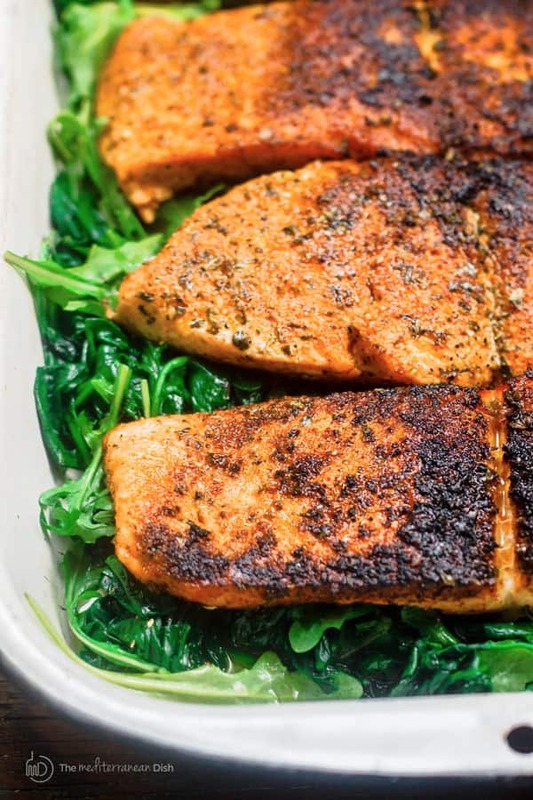 Avoid over-cooking salmon no matter the cooking method. 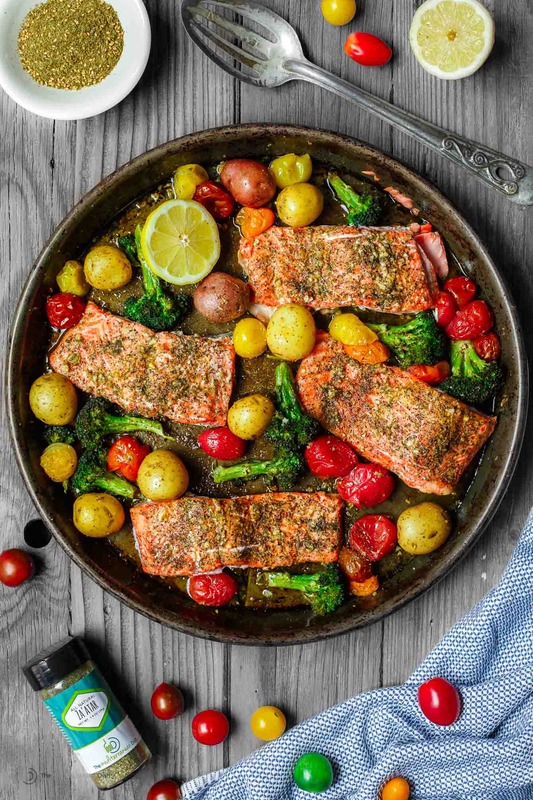 Even thick salmon fillets will cook fairly quickly, so don’t walk away too far from it as it cooks. 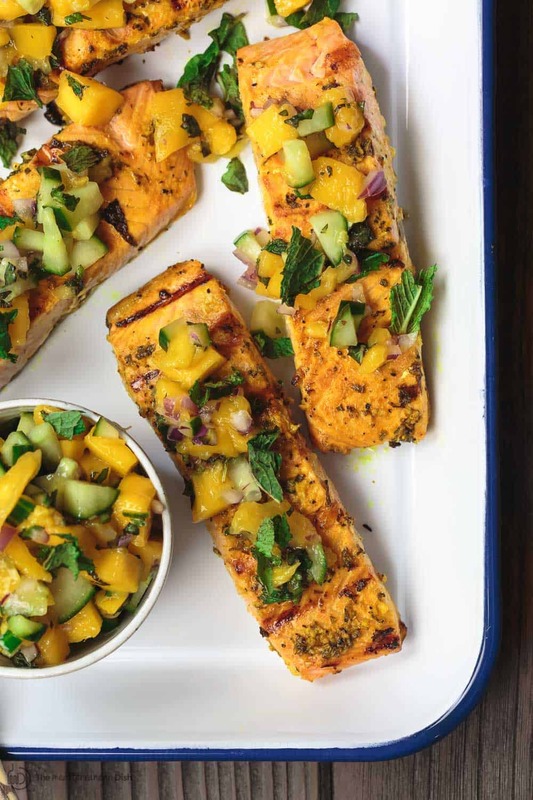 As a general rule, salmon is ready when the flesh looks opaque and flakes easily with a fork. The recipes below will provide specific instructions, still it’s good to watch closely as your oven or grill will be different. 3- What to serve along salmon? If you view the salmon recipes below, they will likely have some specific suggestions. But, I’m always up for adding a large bright salad like fattoush; balela; Greek salad; or this simple 3-ingredient Mediterranean salad. If a recipe doesn’t already incorporate a side of veggies, I highly recommend Italian roasted veggies; these Greek green beans; or simple herb-tossed sweet potatoes. A drizzle of tahini is always a welcomed addition, if the salmon recipe doesn’t come with a sauce. 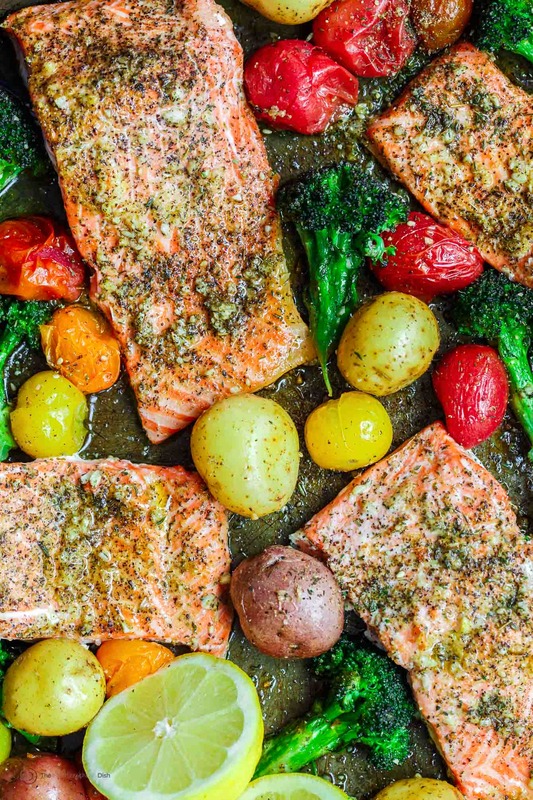 Let’s get to the epic salmon recipes now, shall we? 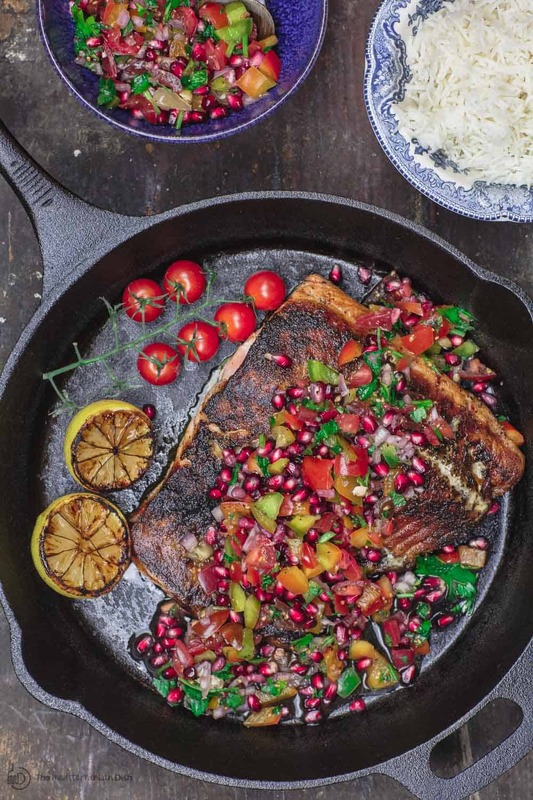 "Mediterranean Blackened Salmon Served with Grilled Lemon Halves, Pomegranate Salsa and Rice"
Za'atar Garlic Salmon Recipe | The Mediterranean Dish. 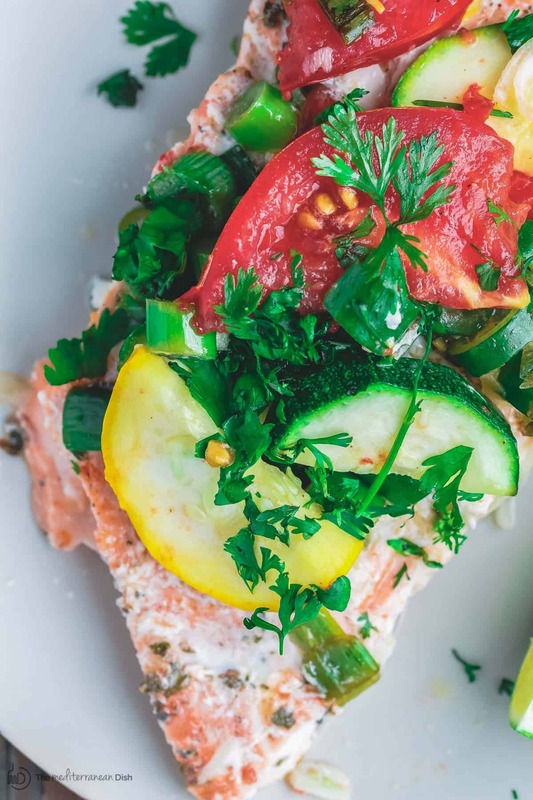 Pan sheet garlic salmon with a Mediterranean twist you will love! Crusty za'atar, lemon juice, olive oil and veggies all on one sheet. Ready in 25 minutes! See the recipe on TheMediterraneanDish.com"
Baked Salmon Recipe with Garlic Cilantro Sauce | The Mediterranean Dish. 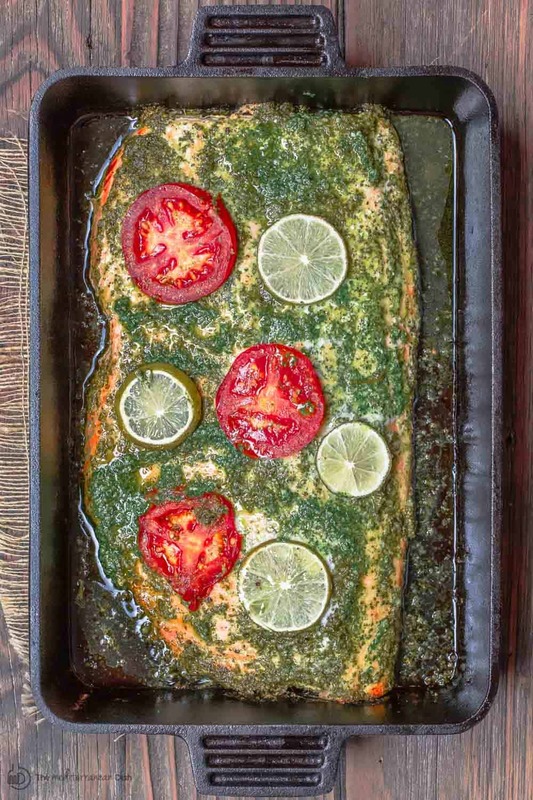 An easy baked salmon covered in a special garlic cilantro sauce with a hint of citrus. Takes only 15 minutes start-to-finish! I make this one all the time, for weeknight dinner or a holiday dinner! See it on TheMediterraneanDish.com"
"Mediterranean Salmon Burger Recipe | The Mediterranean Dish. Light, moist, flavor-packed salmon burgers with a Mediterranean twist. Recipe comes with great tips to help you make the best homemade salmon burgers. 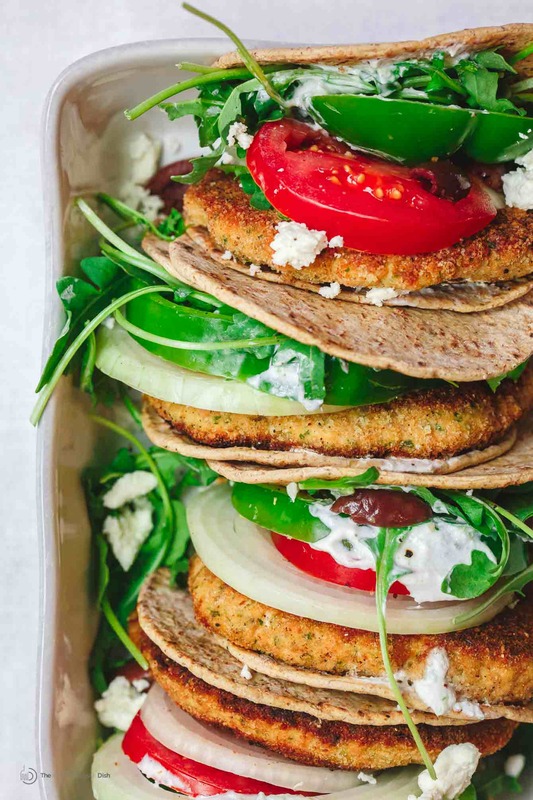 Toppings like homemade tzatziki sauce and a zesty arugula mixture, olives, and feta, make this the perfect Mediterranean diet meal. Low carb. See it on TheMediterraneanDish.com"
"Pan Seared Salmon Recipe with Orange Juice, Wilted Spinach and Arugula| The Mediterranean Dish. It takes less than 15 minutes to prepare this elegant, no-fuss dinner. Season the salmon; sear in olive oil, and add a splash of orange juice. See the step-by-step from @themediterraneandish."